Louisiana Sunshine Soap Company is a small, family based soap-making company that I started in my home in 2013 in Sunshine, Louisiana. Sunshine is a small town located just outside of Baton Rouge. I started making handcrafted, artisanal, soaps one batch at a time when I retired several years ago. When I first started creating the soaps back then, I was making them for family & friends and tailoring them for my own, and family's & friends', allergies and sensitivities. I found that I could minimize skin problems & sensitivities with my individually developed formulas. And in 2013, I received an offer from a business to buy my soaps and that's what ultimately launched my business. These soaps are created by using a wide variety of nourishing oils to make them balanced in Hardness,Cleansing, Bubbly Lather,Creamy Lather, and Conditioning. The oils are carefully chosen for the unique qualities they possess. My product testers are not animals, they are myself, and my family & friends. Many of my soaps are made with Essential Oils (Essential oils are botanical extracts of various plant materials, and do not only originate from flowers, but from herbs, trees and various other plant material, as well.). Some of my soaps are made with premium Fragrance Oils. The fragrances oils I use are always phthalate free. If you are sensitive to using only natural ingredients, you may want to look for my soaps that are made with Essential Oils, instead of Fragrance Oils. My soaps are paraben free, preservative free, and most are vegan-friendly. I proudly list EVERY ingredient in all of my products. So please check the ingredient labels on the products to determine which ones may suit your needs. Due to the natural process that cold process soap goes through, a slight bit of weight, color, design and even textures may vary slightly from batch to batch, but quality and safety remain the same. My soaps are cured for at least 4 weeks with Cold Process method & 1-2 weeks with Hot Process method to assure that you get a nice hard, long lasting, very creamy bar of soap. PLEASE NOTE: Once the natural process of saponification is complete, the sodium hydroxide (lye) and oil molecules have combined and have chemically changed into soap and glycerin. While all real soap must be made with lye, no lye remains in the finished product after saponification. To maximize the life of your soap, keep it in a well-drained soap dish so it can dry between uses. 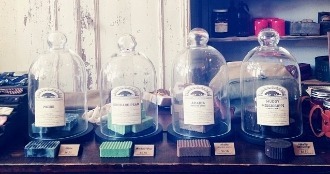 Natural soaps need to breathe. Exposure to air promotes hardening of your soap and contributes to longer-lasting quality. Soap should be left unwrapped or wrapped with breathable materials. For maximum benefits, I recommend that you use your soaps within twelve months of purchase, especially if they are scented. This is because the oils that I use have different shelf lives and may go rancid after that shelf life has expired. Louisiana Sunshine Soap Company is not responsible for any individual reaction to any particular ingredient. Each product package includes a complete list of ingredients. People with sensitivities to any listed ingredient should not use the product. It is also important to note that some essential oils are unsuitable for use during pregnancy or if you have immune issues and others can be skin sensitizing. Always consult your doctor, or midwife if pregnant, to get advice for what is safe for you to use. My soaps are packaged in recycled/recyclable cardboard & paper. I reuse boxes and Styrofoam peanuts obtained from items that are shipped to me, and hope you will reuse your shipping materials too! I even share excess peanuts that I receive with a local shipping company & I hope you will do the same. The organic palm oil that I use in my soap is not sourced from the conversion of rainforest ecosystems or from companies engaged in the conversion of natural forests and/or peat lands; respect the free, prior and informed consent of interested communities and meet or exceed RSPO (Roundtable on Sustainable Palm Oil) principles and criteria. Thank you for your interest and purchase of my products!